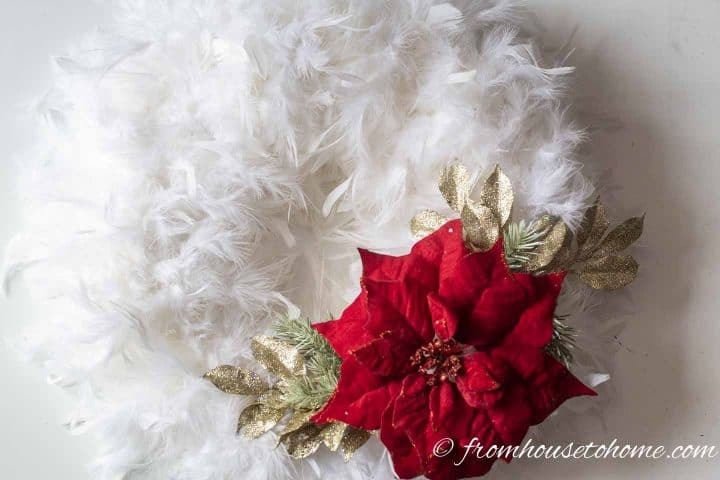 This DIY white feather Christmas wreath combines the look of snow with a red poinsettia and evergreen branches to create beautiful and unique Christmas decor. 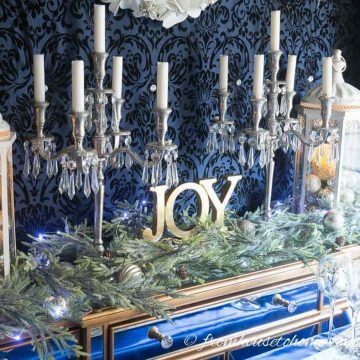 Using feather boas for Christmas decorations is one of my favorite easy and non-traditional ways to decorate for Christmas. 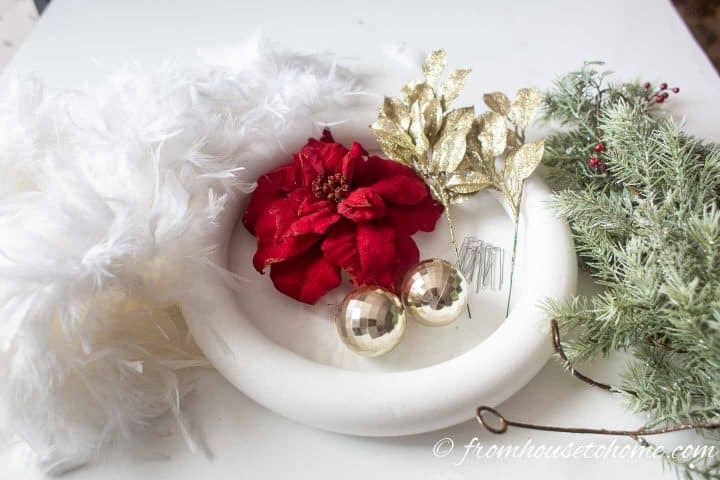 So this DIY white feather Christmas wreath isn’t much of a stretch for me, although using such a traditional red, white and gold Christmas color palette is! (Which definitely runs in the family as you can tell from the DIY purple mesh wreath my mother made for her house last Christmas). This marks the start of some serious Christmas decorating! This year I’ve decided to do a red, white and gold color theme in my living room. 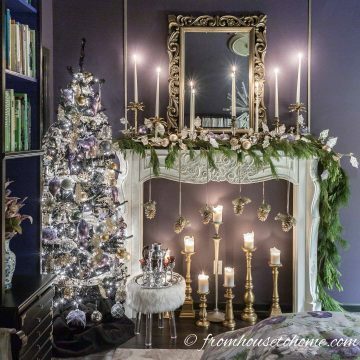 Although this is a traditional Christmas color scheme, it’s very unusual for me. In all my years of doing Christmas decorations, I don’t think I’ve ever used red before! 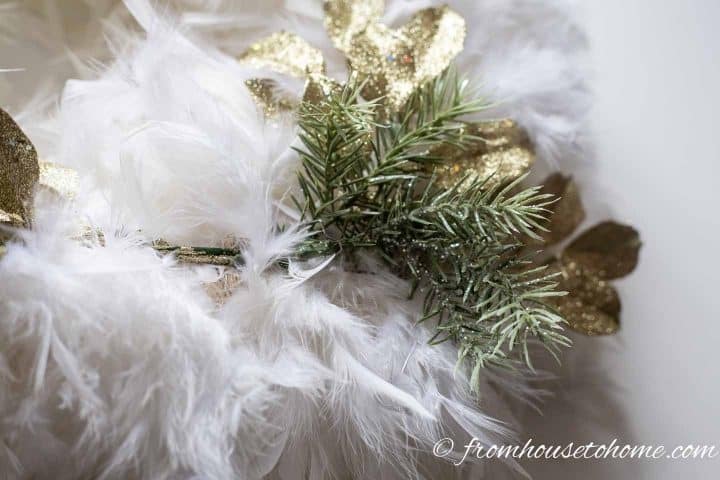 First up is an easy DIY white Christmas wreath that uses one of my favorite non-traditional Christmas decorations – white feather boas. It’s a really quick project that looks pretty hanging in my living room windows. This is all part of the 4th annual 12 days of Christmas event, so be prepared for a whole lot of DIY Christmas wreath tutorials and inspiration which you’ll find at the bottom of the page. 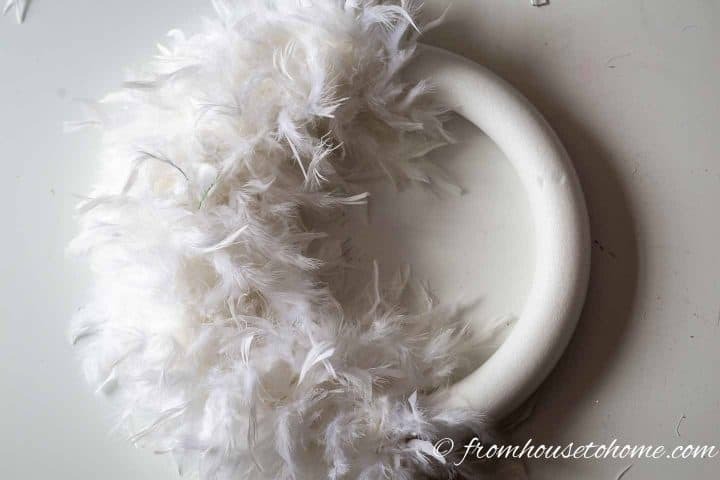 So let’s get going on my DIY white feather Christmas wreath! 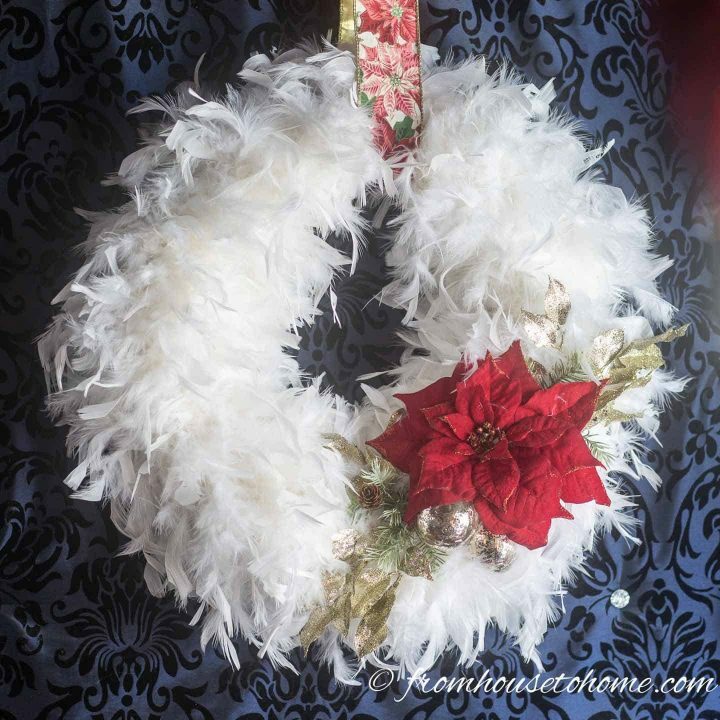 Styrofoam wreath – I made 2 different sizes – 14″ in diameter* (these are a great deal!) and 16″ in diameter*. 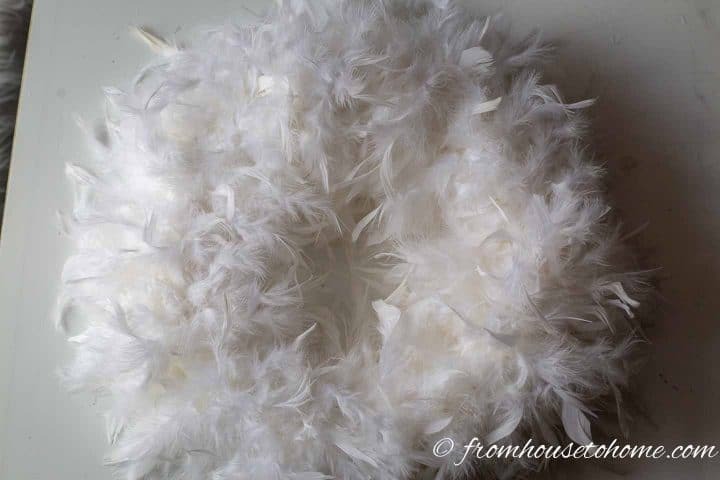 2 6′ long white feather boas* for the 14″ wreath, 3 feather boas for the 16″ wreath. I buy the cheapest ones I can find for crafts. 2 Christmas ornaments. I used plastic ones so I don’t have to worry about them breaking. 1. 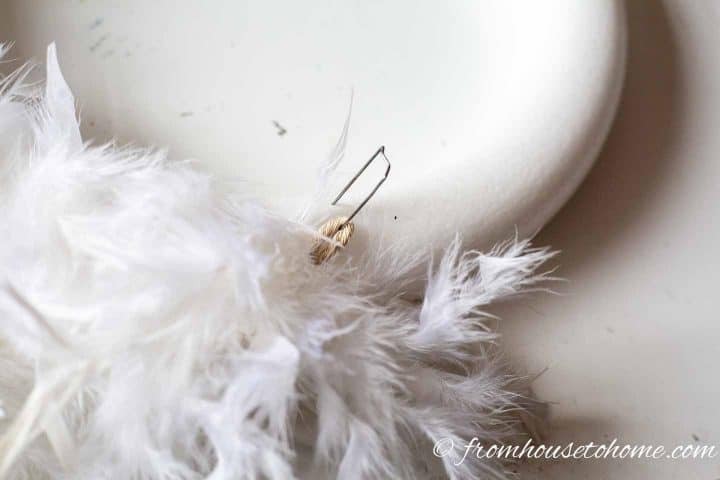 Pin one end of the first feather boa to the styrofoam wreath using a floral pin. 2. 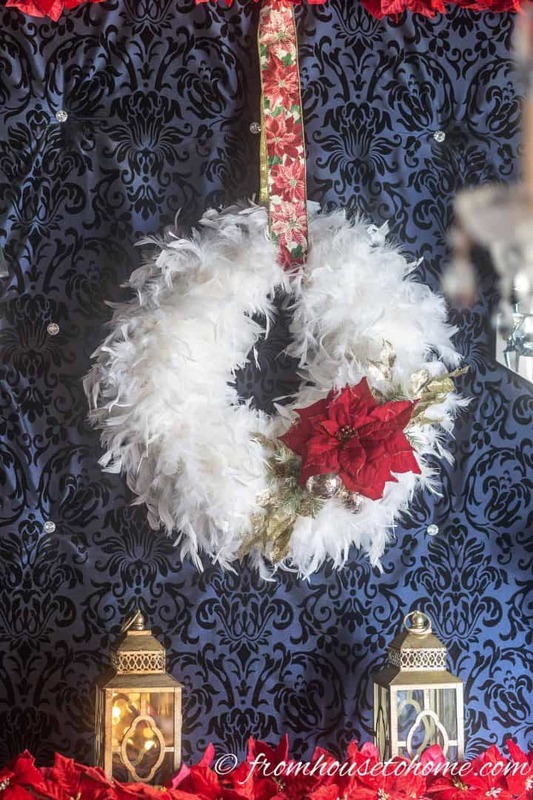 Wrap the boa around the wreath until you get to the end. 3. Pin the other end of the first feather boa and the start of the second feather boa to the wreath form. 4. Repeat with the second boa to cover the other half of the wreath. 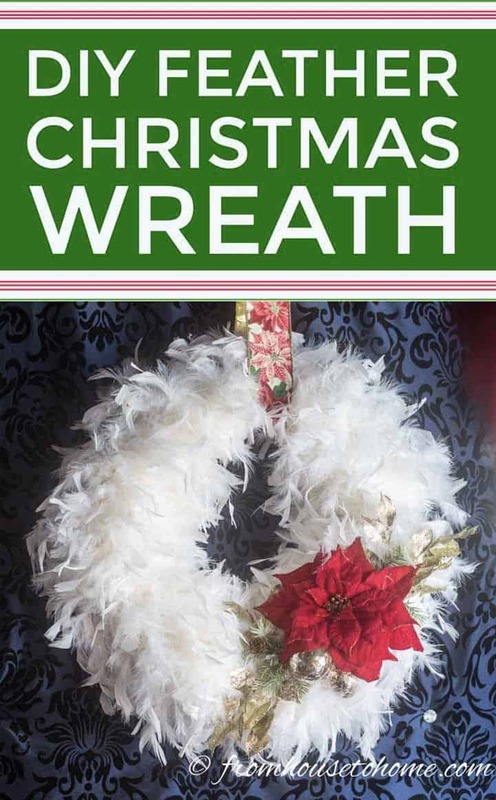 If you’re making a 16″ wreath, you’ll need to use 3 boas to get good coverage of the wreath form. If you want a simple Christmas wreath, you could actually hang it just like this. But I added some Christmas ornaments to match my decor. 1. 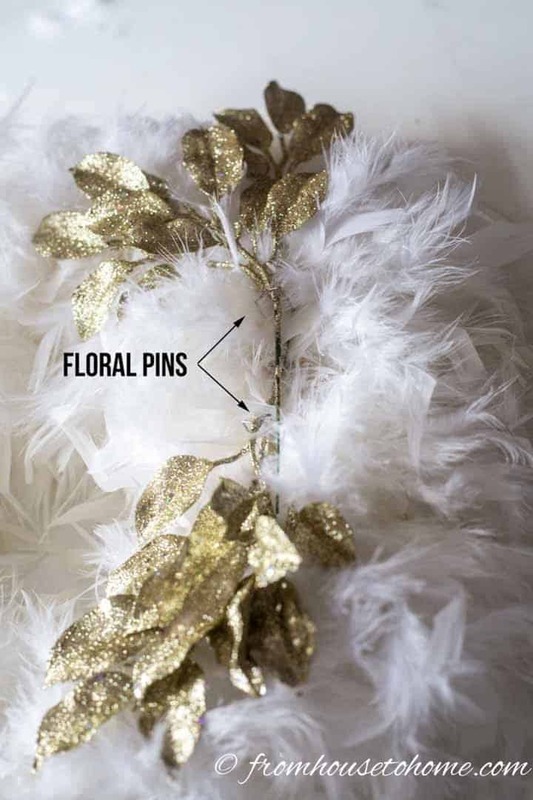 Place the gold leaf picks on the front of the wreath form so that the stems cross and pin in place with floral pins. 2. 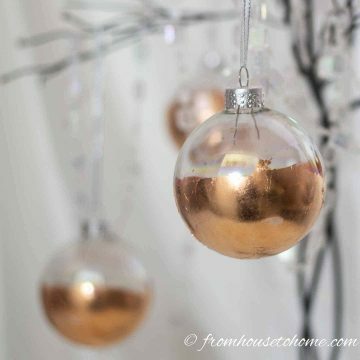 Take a couple of small branches off your evergreen garland (or use evergreen floral picks) and pin them in place on top of the gold leaves. 3. 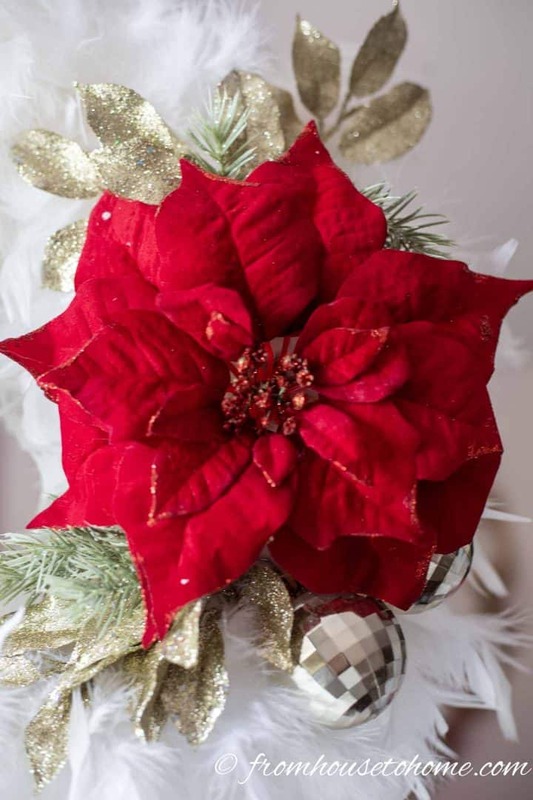 Make sure that the ends are close enough together so that the poinsettia flower will cover the stems. 4. 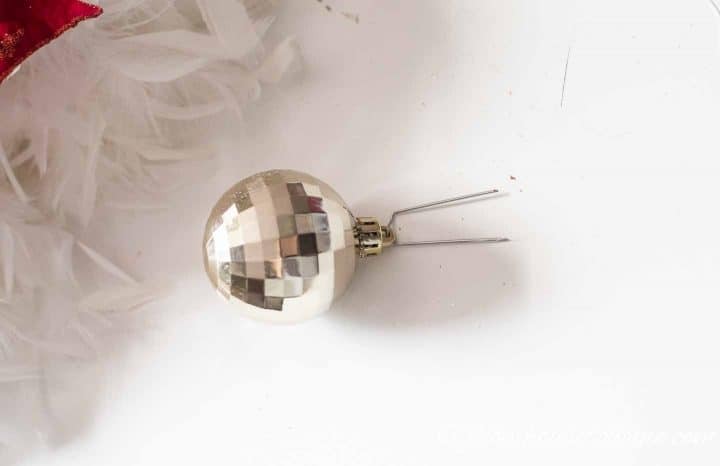 Clip the poinsettia Christmas ornament onto one of the picks so that it covers the stems. 5. Hook one of the ornaments onto a floral pin. 6. Pin it onto the wreath at the edge of the poinsettia flower. Repeat with the other ornament. 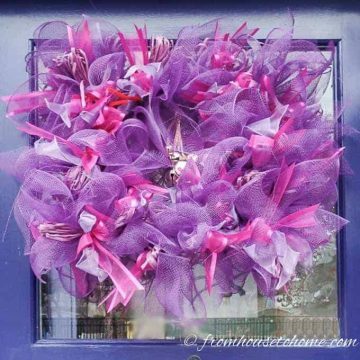 Cut a piece of ribbon that is long enough for the wreath to hang down as far as you need it to. Wrap the ribbon around the wreath so that the poinsettia is on the bottom left corner of the wreath. If you want to make sure the ribbon stays in the right place, use a floral pin to pin the ribbon to the back of the wreath. I used a stapler to attach the ends of the ribbons together, but you can tie a knot if you prefer. If you don’t want to use ribbon, you could also push one of the floral pins most of the way in to the back of the wreath at the top. Then use the loop from the pin to hang it on a hook. 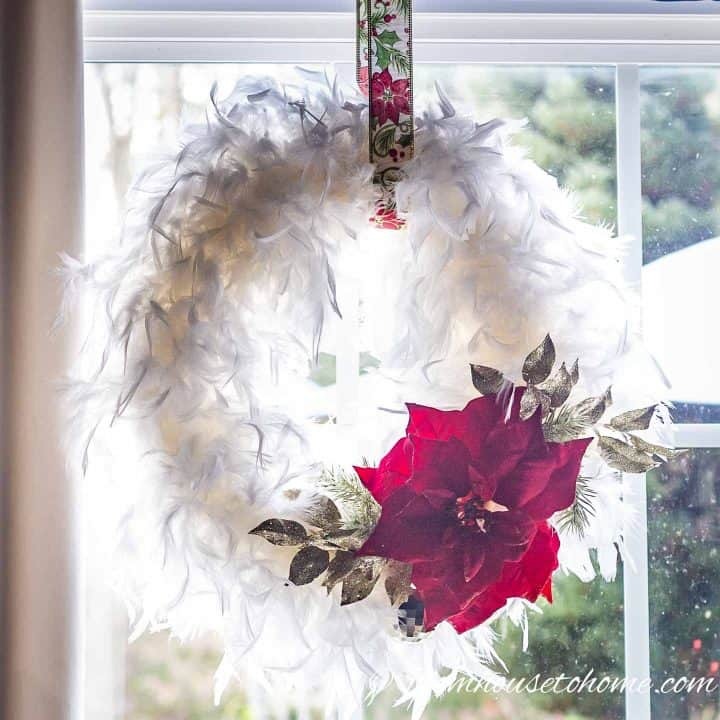 I used the 14″ wreaths to hang in the windows in my living room. 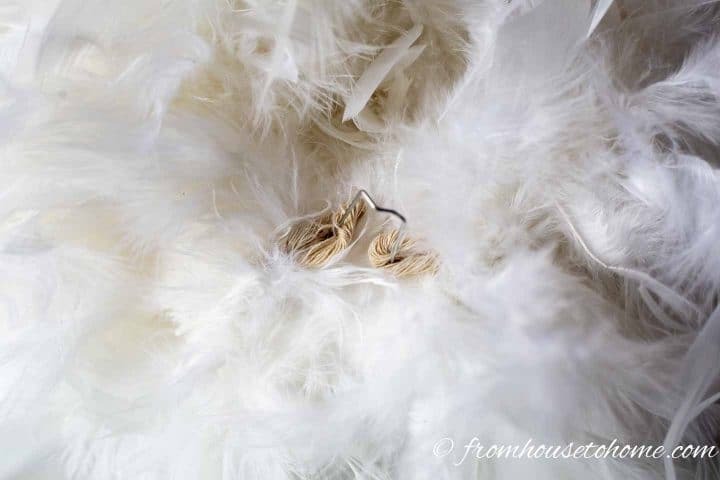 I love the way the light shines through the feathers. In my dining room, I hung the 16″ wreath above the buffet. 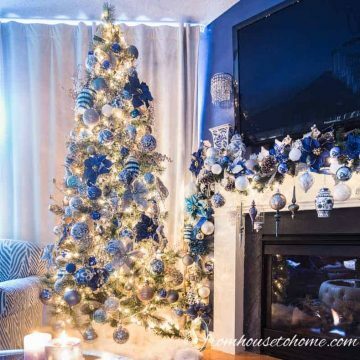 And it’s beautiful with the red, white and gold Christmas decor I’m doing this year. Be sure to stay tuned to see how the rest of it turns out…it will be on the blog in a couple of weeks. 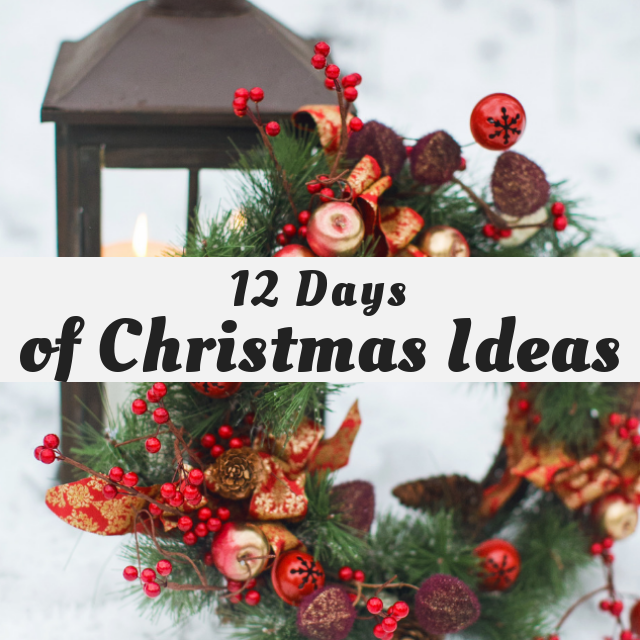 Scroll down for many more DIY Christmas wreath ideas for your holiday season! 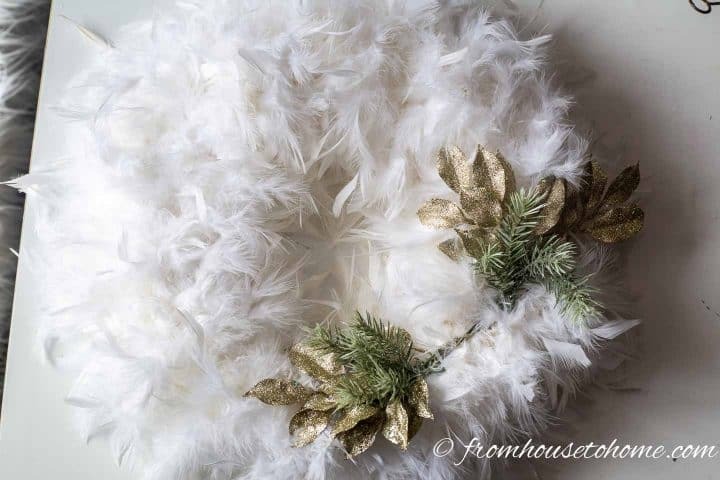 Have comments or questions on our DIY white feather Christmas wreath? Tell us in the section below. When it’s hung in the window it has an almost fairy type quality to it! Love it! 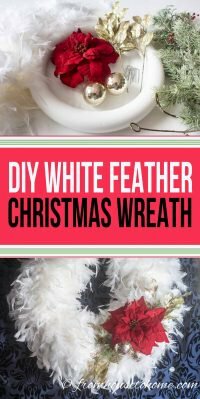 I have made wreaths for Halloween using black feathers, but never considered using white ones for Christmas. At least not until I saw your pretty wreath.